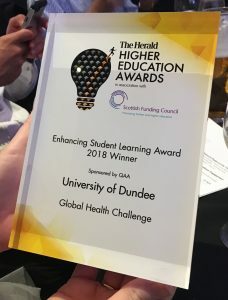 The Global Health Challenge (GHC) saw success at the Herald Higher Education Awards in Glasgow on 28th June when it was announced the winner of the Enhancing Student Learning Award. Members of GHC co-ordinating team were delighted to receive the award from former University of Dundee Rector, Fred MacAulay. Student feedback over the past two years has highlighted how much they love the interdisciplinary approach of the GHC and how they value and appreciate the input and support from academics and our agency partners and their clients. Many students have commented on how the GHC has increased their connection with Dundee and given them a desire to give something back to the local community. Working on real life problems, being able to develop their creativity and continuing to volunteer has seen the GHC develop into a rich and unique learning experience. It’s therefore fantastic to see the GHC be recognised with the Enhancing Student Learning Award, sponsored by the Quality Assurance Agency. The GHC co-ordinating team would like to thank all the local agencies that have contributed to the Global Health Challenge over the past two years. The GHC and this award wouldn’t have been possible without their enthusiastic and dedicated contributions. Thanks too to academic colleagues from across the University for their support with mentoring and sponsoring challenge projects. We’re looking forward to our third year of the GHC and plans are underway for the launch of GHC18 in October. Creating personas and empathy mapping.